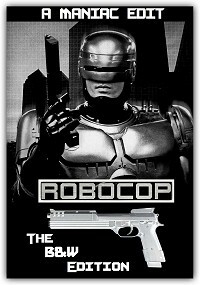 This is a Black & White edit of Robocop 1 & 2. Some alternative cut of the earlier Extreme Edition. To make a more improved version of it now in 2.35.1. In the making of The Extreme Edition some idea's didn't work but in this cut my first ideas are succeeded. This is a fun edit - all the action from Robocop 1 &2 packed into 83 minutes. It's a wild ride and any fans of the original will enjoy this. The narrative is a little lopsided towards part 1, so we don't fully get why the events from part 2 are happening, but I'm not sure we really care all that much. There's bad guys and Robocop is fighting them. Good enough. The B&W treatment is fairly well done, although it's more grey & greyer than black & white. It's really tough to do a B&W conversion and the editor has done about as good a job as possible. The only thing that really threw me was the news reports - it was very odd seeing news report in black & white when you know that colour TV exists in the Robocop world. All told, this is a fun edit and recommended for anyone who enjoys some good action.